Lazy economics cont. - with graphs! Okay. In my last post I outlined my criticism of Christine Li's argument for cash transfers to the homeless. That's where the substantive action is. This is going to be a really dry post. Apart from my main criticisms, I observed while reading the article that the written argument presents things in a way which isn't consistent with how economic analysis - at the same basic level which I think is inapplicable to problems like these - works. So I'm going to go through and try correcting the errors within the method - whilst maintaining that the method just isn't appropriate to the question at hand. Let’s assume that all goods in the economy have to be paid for: either by their own income, or by charity vouchers. However, their limited income allows them to spend mostly on primary goods, which are cheaper (and more immediate to survival needs). Secondary goods are provided in the form of charity vouchers and cannot be increased. What's happened here is that we've had the assertion that the homeless can't afford to purchase secondary goods. This is probably a mostly true thing. But to draw a budget line you have to break it down a little more carefully. It's not the case that homeless people can't afford secondary goods at all. There's no reason they couldn't spend less money on food and clothing, and more on books or watching TV. (Obviously nobody actually does that, and nobody wants to, but that's a separate question which we'll get to later.) And the final section of the budget set here, between (5,1) and (6,0), works on this basis: the consumer here can reduce primary good consumption from 6 to 5 and thus allow secondary good consumption to rise from 0 to 1. There's no reason, at this point, why the same couldn't continue to be done. So, running with the stipulated limited income, the budget set is just going to look like any other budget set: a straight line, determined by relative prices. Li claims that secondary goods are more expensive, which seems dubious as a general claim, but let's run with it. This is the real budget line: the possible combinations that could be purchased with the limited available income. 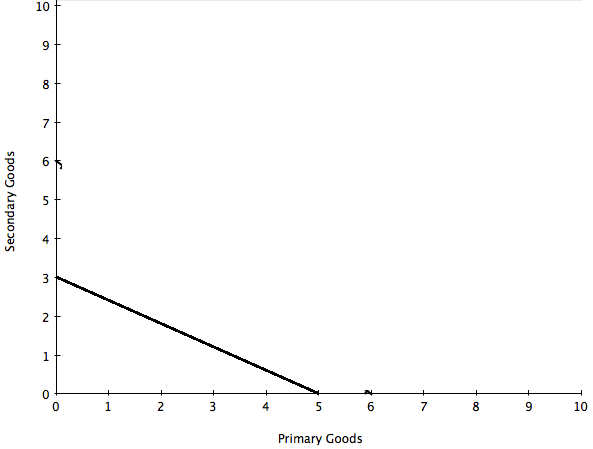 At the extremes, using all the income would purchase three "units" of secondary goods or five of primary goods (since we're working with the assumption that secondary goods are more expensive.) 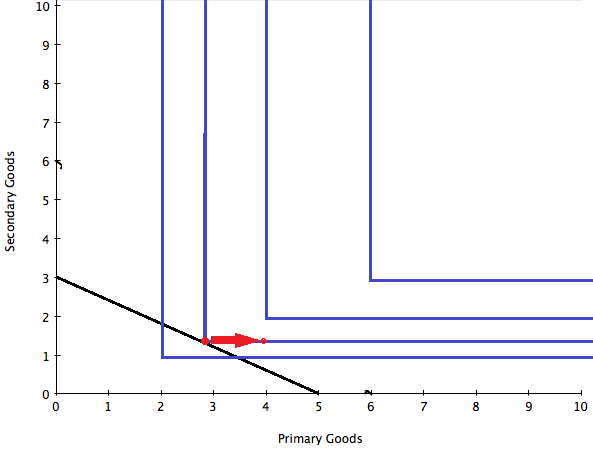 The slope represents the relative prices: you have (0, 3), if you forego one unit of secondary goods you can afford more than one of primary goods since they are cheaper, so you also have (2, 2), and so on. 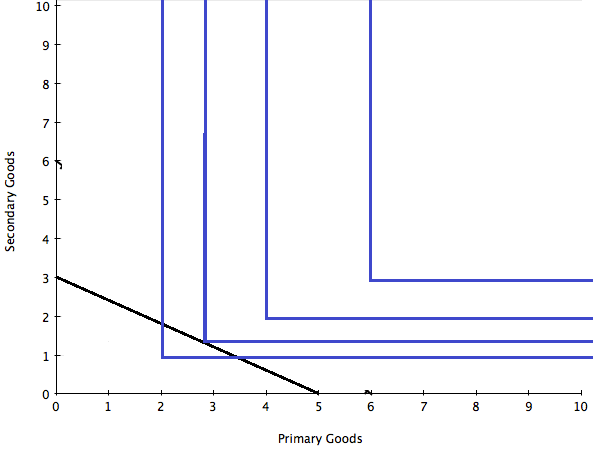 In this diagram the ratio of prices for primary:secondary is 3:5. Now we need to add some indifference curves. The way these work is that each curve represents a certain level of welfare: there are different ways of being just as well-off. Moving up and to the right is an increase in wellbeing: it's a "higher" indifference curve. If some policy or action shifts someone to a higher indifference curve, it increases their welfare. Let's momentarily run with the perfect-complements assumption, so the curves are L-shaped: primary and secondary goods need to be consumed in fixed proportions, otherwise there's no utility increase. It's worth considering that this is a really strong claim: it's not that it'd be better or ideal to consume things in certain proportions. 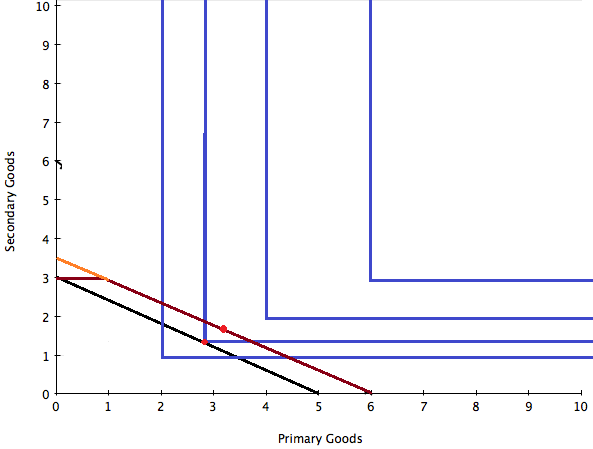 It means that increasing the consumption of primary goods literally won't make you better off at all without an accompanying, proportional increase in secondary goods. The ordinary examples of perfect complements are things like left and right shoes, bike wheels and frames, razors and blades. It's really, really, really unlikely to apply across this primary/secondary distinction. But let's draw those curves. I've also stuck with the 2:1 complements proportion. Since we of course have an optimising consumer, the consumption point is on the curve which just touches the budget line. Alright: here is our homeless consumer, with a minimal income, consuming primary and secondary goods in fixed proportion. The chosen purchases are those which together make this person as well-off as they can be, given this income. If you spend all your money on primary goods, you can afford five, and you end up with six because you're given one. On the other hand, if you spend all your money on secondary goods, you can afford three - but now you end up having a unit of primary goods as well, because you're given one. So the in-kind transfer pushes the budget set right by one unit. The optimising position is at the new red dot. And this one is on a higher curve. The transfer has made the homeless consumer better off: even with the silly assumption that essential and non-essentials are perfect complements. That's the result of doing the analysis properly. Now you can actually use this analysis to prove that cash transfers can be even better, just not the way Li did. And you don't get the extremely strong result that in-kind charity doesn't make the homeless better off at all. Here's how it goes. This consumer, unlike the one receiving in-kind charity, can trade off primary/secondary totally: the choice is entirely theirs. Now in this case the new choices are obviously on a significantly lower indifference curve. But the ratios for prices and complementarity were plucked from nowhere, and there are some cases where the choices made available by cash transfers might be preferred to those possible with in-kind gifts. In this case both in-kind transfers and cash transfers unambiguously increase welfare. The cash, though, is best, because it gives more options - including some which this person prefers. So that is the argument for money rather than in-kind charity: for people like the one represented in this last picture, they are able to make choices which they prefer, and for people like those in the previous set of diagrams, they can choose exactly the same bundle and so aren't any worse off. It's a no-lose situation. There are two big (and connected) reasons to be wary, one within consumer theory and one outside it. The first is that the kinds of indifference curves you need for anyone to be better off are not especially plausible. Have a look at the last diagram. (The caveat here is that I'm not very good at drawing, and it's easier to draw an extreme picture, but the general point still applies.) 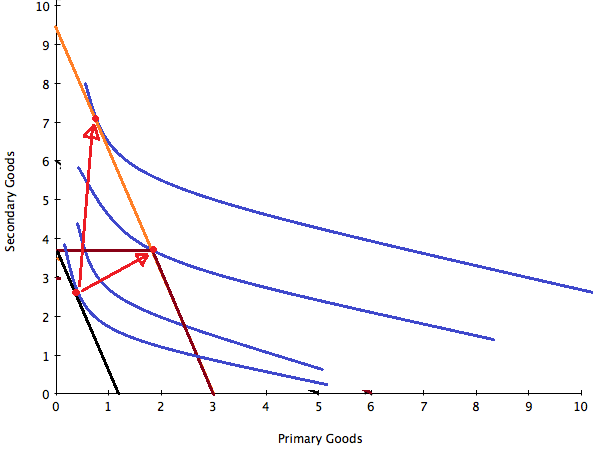 As the budget set shifts out from the black line to the orange one, that increase in purchasing power is overwhelmingly taken as more secondary goods rather than more primary goods. This implies that if you have a sum of money to spend for a homeless person, you will increase their welfare most by spending most of that money on non-essentials and only a small fraction on essentials. That seems a strange view of what homeless people need to improve their wellbeing. 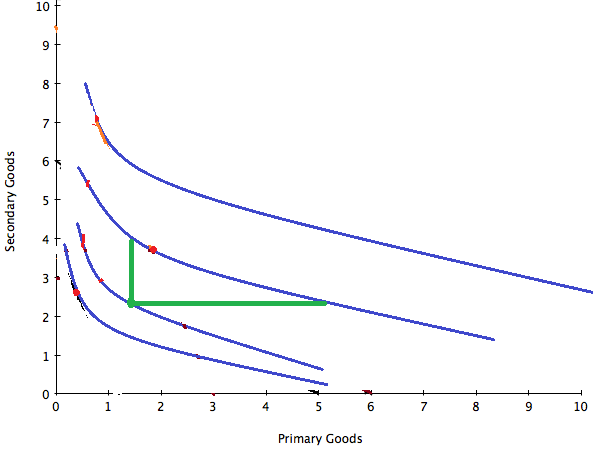 From the green dot at the corner, we can get to the higher curve either by increasing primary goods by quite a lot (~4 units) or by increasing secondary goods by not nearly as much (~1.5 units). That is, giving this person 1.5 units of secondary goods is exactly as good for their welfare as giving them 4 units of essentials. Pound-for-pound, the non-essential goods are much better for this person than essentials. If people like this are really rare - which seems more or less reasonable - then there's no reason to think cash transfers instead of in-kind charity would make many people better off at all. Conditional cash transfers can stamp out the risk of spending the cash on more unproductive primary goods, or towards ‘bads’, such as drugs, alcohol and gambling. But conditional cash transfers are really not cash transfers at all. They are much closer to in-kind transfers, or at best a hybrid. And once you make this concession, that people don't always choose what's best for their welfare, then you concede that enabling more choices isn't necessarily a foolproof way of improving people's lives. That's the core rationale for thinking that cash transfers are better, though, so much of the argument disappears there. Most boring post I've ever written.